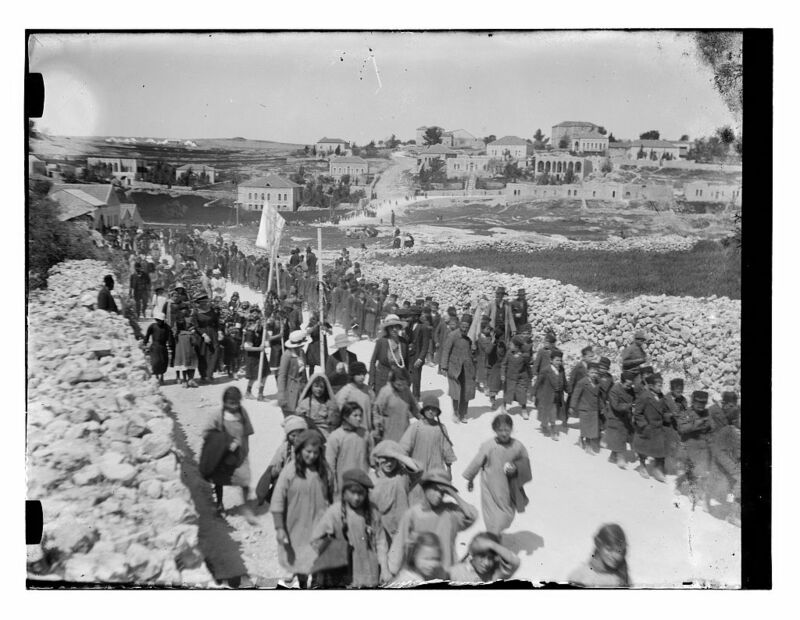 Picture a Day - The Holy Land Revealed: Another Mystery Picture from the Library of Congress Collection. Miscaptioned Photo Begs the Questions -- Who, What, Where, When? Another Mystery Picture from the Library of Congress Collection. Miscaptioned Photo Begs the Questions -- Who, What, Where, When? ﻿ ﻿The Library of Congress caption says this is a picture of a "Turkish procession," taken sometime between 1898 and 1918. Turning to the new picture, why do we reject the caption of a "Turkish procession?" Because of the many identifiable Jews throughout the crowd. and bearded Jews in the background. What else do we know from the picture? There is a sign post in the middle of the picture, but it cannot be read even after enlargement. Behind the sign post, on the other side of the road, is another sign. Two men are apparently writing on it and have drawn the attention of marchers around them. The day is neither Sabbath nor a Jewish holiday when observant Jews are forbidden to ride on the horses or in carriages which appear in the photo. Not is it likely to be Chol Hamoed (the intermediate days of Sukkot or Passover) since Chassidic Jews would be wearing their shtreimels (round fur hats). 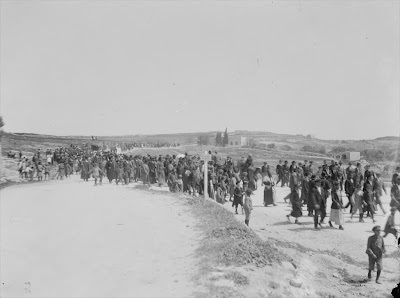 Not only is the picture not of a "Turkish procession," it is likely that the picture is taken after the Turkish defeat in Palestine in1917-1918. In the middle of the picture appears to be a British soldier in uniform and flat-top army hat. Can it be that this is another picture of Jews marching on Lag B'Omer, the same day in 1918 as the children's "enigmatic" picture above, a Spring day between Passover and Shavuot when Jews traditionally take hikes into the countryside and visit the graves of sages? Is it this semi-holiday when traditional Jews can ride and walk beyond the city limits? But where are the marchers going to or coming back from? Their shadows suggest that they're not walking at the same time of day and direction as the children's procession. Readers are encouraged to add their opinions and attempt to decipher the words on the signpost. I see no women. If so, perhaps a funeral? The previous picture is of a grave (but not Jewish) so maybe the proximity has nothing to do with the sbject. But if so, consider that Samuel's arrival is ther subject of thre next picturee, so perhaps they are walking to his arrival location? Using the best quality image and the Picasa viewing tool, I could see that the sign in the foreground is a sign with arrows pointing both ways along the road. I think that on each arrow is a number followed by a word, presumably indicating distance and place name. The sign in the background is inserted in the ground held by posts either side. The top line is in western letters and the bottom is in Arabic. The first symbol is an '8' (visible also in the Arabic – the number resembling an upside down V). There are three words written, and the second one appears to be 'for' or 'fur'. I would guess the sign relates to the area of land it is inserted into or the building behind e.g. a 'for sale' notice.